Government programs address child hunger, often through schools: from breakfast in the classroom to free and reduced lunches, millions of children are getting fuel for their day. But what about the “hidden hungry”? The kids these programs can’t help? There are hundreds of thousands of kids heading to school every day from homes with enough food and resources. But they are too distracted, anxious or scared to eat. How much time does your child have to eat? Can he open containers on his own? Is temperature an issue? Does he prefer foods hot, warm or very cold? Is lunch right before recess, so he’s eager to get outside to maximize playtime? Is he eating in his snowsuit or carrying gloves, or has a hat that gets in his way? Are adults or other children pressuring him to eat? Ask him to tell you about where he eats: is it loud, is he rushed, who does he like to eat with? Join him for a meal. 1) Pack preferred foods in familiar containers or packaging that he can open on his own. You might even practice at home. 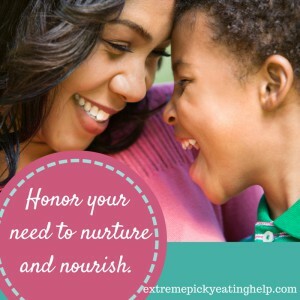 If you are trying to pack more of a variety of foods, but your child’s lunch is coming back day after day untouched, honor your need to nurture and provide. It’s all right, particularly in the beginning, to pack foods your child is very likely to eat. We hear from kindergarten teachers that new students are way more likely to eat ‘snack’ type foods at lunch during the first few weeks of school. Rotate in choices from his “preferred” list if you can, or include small amounts of more challenging foods. A baggie of his favorite dried cereal, a breakfast bar, or his accepted yogurt tube is fine for lunch. Pack drinks, smoothies, or supplement drinks he likes. Chocolate milk on his list? That’s got filling protein and carbs (many are lower sugar than they used to be if that concerns you, and sugar in milk is energy served in a package of protein that helps even out energy levels and blood sugar). 2) Talk with the child’s teacher and staff and ask them not to interfere or pressure. Eating this-before-that rules, or requiring kids to eat certain amounts or in a specific order can increase anxiety and pressure, which can kill appetite and make picky eating worse. 3) Have a filling sit-down snack planned as soon as you can after school. You might even sit in the parking lot to let him eat. This should be new foods, not just what he didn’t eat for lunch. Avoiding the perception of punishing him for not eating is helpful. If he’s happy to sit and eat from his lunch, that’s fine. 5) Don’t grill him about what he ate. Avoid the temptation to ask about what he ate, to grill the teacher in front of him, or inspect his lunchbox first thing when you pick him up. This added attention and fear of disappointing you can mean more anxiety, and you guessed it, less appetite. Look in his lunchbox when he isn’t around. Pretend it doesn’t matter. Give him the message that he can manage his eating, even if he is still learning right now. 6) Involve him in choosing and packing lunch. While involving him somewhat with lunch planning is fine, this is sometimes a false promise of hope. Moms tell us all the time that they involve their kids in shopping, cooking, even growing the darn food, and the kid still doesn’t eat it. Further, when kids are involved, this can open the door to pressure. “You chose those crackers, you have to eat them!” Many small kids don’t know what they will feel like eating in advance, so for the most part stick with your job of deciding what to offer. Also, if you make it a big deal, he knows how much it upsets you, and that can fuel negative behavior. It’s not that he is being naughty– developmentally it’s his job. If he has a favorite cartoon or super-hero, find a thermos or lunchbox with that theme. 7) Think outside the box. One of our kids doesn’t like bread much, so we end up sending thermoses with microwaved peas, or edamame (shelled or not), or left-over stir-fry with rice. Sometimes it’s a handful of crackers and cheese, with rolled up turkey and a little container of Miracle Whip. Including a “treat” can help as well. 7) Consider his preferences. Find ways to keep foods cold if he likes cold, freeze tube yogurt, or pack foods frozen and in a thermos. If he likes leftovers warm, preheat a thermos and heat the food extra-hot before you pack it. If he likes crunchy foods, consider freeze-dried fruits and veggies. 8) Work on sensory obstacles. Can he sit at a different table that’s farther away from the noise of the kitchen or the kids lining up to leave? Can you suggest that the school move recess time to before lunch so the kids aren’t anxious to get outside and they can have some big muscle play time to get the wiggles out and self-regulate? Can they put on their snowsuits after the meal so they aren’t too hot? Monitor how things are going and move at his pace. One typically picky child who ate a fair variety at home was anxious when his family moved overseas, refusing anything for lunch at his new kindergarten other than peanut butter and jelly sandwiches. For the first six weeks, that’s what his mom packed, and as he learned more of the language, made some friends, and his general anxiety decreased, she added more variety. Having the fuel to get through the school day is as important as what is being taught. Uncovering the reasons behind the ‘hidden hungry’ can go a long way toward giving your child the best chance at keeping his tank full for his days at school. For more information, check out our book Helping Your Child with Extreme Picky Eating. If your child is older, Conquer Picky Eating for Teens may help!